The Kid Without Fear�well... maybe a little bit of fear, joins the Gentle Giant Ltd. Marvel Animated Statue series! 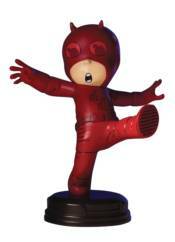 Daredevil will be the 13th character in their popular and adorable Marvel Animated statue line. The blind acrobat crimefighter is clearly still learning the ropes in this statue, inspired by the month-long variant cover event that helped birth these statues! The Daredevil Animated Statue was digitally sculpted and carefully printed on state of the art 3D Systems 3D printers. The high-resolution prints were then used in the creation of prototypes needed to produce this animated collectible. Each animated statue is hand-cast, hand-painted, and hand-numbered with a limited edition Certificate of Authenticity.